If things like APE codes and SSI and the INSEE are words which are confusing, or that really you’re just not quite sure what they’re about, then this is the place to be. I really want to take a little look at some of the different jargon we can get when we have a business in France. It’s already bad enough trying to understand the different business types, but once you have your business, you are inundated with documents with lots of acronyms that you have no idea what they mean ! So I thought I would try and demystify some of the jargon for you. Of course if just the thought of reading this is giving you a headache, then you should join the Auto Entrepreneur Serenity Club! Stop here and just email me !! The first thing I wanted to look at was the APE code, otherwise known as the NAF code as well. Basically, when one sets a business up in France, you are given a set code which is appropriate to your business activity. Really what happens is you would describe the activity you are involved in when you set up your business with your CFE (see below for more information on this acronym) and they will then give you an APE code. When I say “they”, it’s the INSEE that will give you this code. You can add activities and APE codes to your business. So you can understand that it’s very important when you set up a business that you describe exactly what you are doing so you get the appropriate code. If you Google “APE codes”, you’ll come up with a whole list. Of course for any of my members, then just come back to me and I can provide you a list in English so you can find the right activity. The second one I want to look at is the INSEE. When you set up an auto-entrepreneur business or any business really, you will get your business registration document from the INSEE. The INSEE is the French National Institute for Statistics and they basically would provide you with your unique identification number when you set up a business in France; it’s a 9-digit number and is called a SIREN (more below). The INSEE, they also provide statistics on business set-ups, business close-downs, and anything related to business in France. The next one I want to look at was CFE. This one is the Centre de Formalitiés d’Entreprises, which is basically the organization that you would deal with when you’re setting up, modifying or closing a business. Now, what makes it complicated in France is that there are three CFE’s and depending on which activity you will have as a business, then the CFE would be different. You’ll probably know the CFEs better by their names, which are the Chambre de Metier, which is for any manual-type activities—plumbers, hairdressers, beauticians. Then we have the Chambre de Commerce, which is basically as it sounds, it’s really commercial activities. That would be boutiques or online sales, if you in the rental business, then that would be a commercial activity. Then lastly, you have the URSAFF, which is anything to do with intellectual activities such as consultants, experts in many fields, nurses etc. Really, it’s down to when you describe your activity, you’ll be given an APE code (see above) and the CFE appropriate to your activity will be the one you deal with for setting up your business, modifications or closing it down. The next one I want to look at is the SIRETs and the SIRENs, because it can be quite confusing understanding the difference. As I said earlier, it is the INSEE that will give you your unique identification number and this unique identification number is called a SIREN. It’s a 9-digit number and you’ll need to use this for any of your dealings with the SSI, with the URSAFF, with any of the government organizations. Also, you would need to use it on your business communications, on your invoices, and any official documentation. This SIREN represents your legal business activity in France. You also be given an additional 5 numbers on the end of your SIREN number. The 5 digits that are the end are usually 000 and then 2 numbers. This is really to do with where your activity is situated geographically. It’s about your business address. If you change your business address, the last 5 digits will change, but the first 9 digits, the SIREN, will never change. If you open up another establishment, you will be given another SIRET whereby the first 9 digits will stay the same but the last 5 digits will change to represent your additional address. Let’s look now at the CFE, which is the second CFE, not to be confused with the one we’ve just discussed. This is the one which is the Cotisation Fonciere Enterprise and this is basically a professional tax. It’s a professional tax for any business in France. Originally all auto-entrepreneurs were exonerated for the first three years of business. This is now not the case, so all businesses are exonerated for the first year; however, on the second year, you would pay this business tax at the end of December, the 15th to be exact. It’s an online declaration to be paid so an account will need to be set up. They do not send it by post, so watch out for this one. When you have a new business in France, you will receive a lovely 3-4 page welcome CFE document from your local tax office asking you for details in order to calculate this professional tax for you! Ensure you send this back. The last one that I wanted to look at is the SSI, which is one that causes the most questions and often distress and frustration. SSI is The Securité Sociale des Independants and was created in 2018 to replaced the RSI which was abolished due to many dysfunctions. The SSI’s role is to recuperate social charges (cotisations sociales) for sickness benefits, maternity, invalidity anything to do with a health care is through the SSI. And for certain activities it’s also pension payments. If you are an Auto Entrepreneur, the SSI collects your social charges from you based on a fixed percentage of your gross earnings. So you pay a fixed fee each month or each quarter and the SSI will dispatch this out to the different organisations. For new businesses, you will see the transference of the collection of your social charges to the URSAFF in view of the reform in 2018. 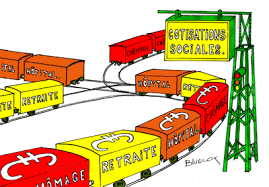 The SSI have the local offices with whom they are linked with for paying you back your health care, which would be the RAM offices or the Mutuelle Santé, Mutelle de Soleil who will then reimburse you for your healthcare and deal with your carte vitale for you. These organizations are affiliated with the government and work with the SSI for your carte vitale. Since January 2019 all healthcare for businesses is now covered by the local CPAM (Caisse Primaire d’Assurance Maladie) so although your declarations will still be made to the SSI and/or URSSAF your reimbursements will be coming from your CPAM. From January 2020 all existing businesses will be transferred over to CPAM from January 2020. Be careful: It may be called a ‘mutuelle’ but it’s not a top up insurance, it’s the base social security reimbursements in France. Well, hope that has cleared a few of the cobwebs away but should you not wish to deal with any of these organisations and you want to speed up your access into the French system, then join the Auto Entrepreneur Serenity Club. We’ve made it our business to understand all about business in France, so that you don’t have to! Find out more by sending an email.